I heard it reported last week that the Mariners were disappointed by the turnout for the series with the Angels -- average attendance 21,529 -- given the gravity of the series with the first place team in the A.L. West. Only one thing surprises me about this: That the Seattle Mariners leadership didn't see this coming. Then again, given the way they've completely mismanaged the team since 2002, nothing should surprise me. The thing that galls me the most about the Mariners -- and from here until the end of this post, when I say "Mariners," what I really mean is Mariners management -- is that they think they're special. That they can stave off the inevitable with clever marketing campaigns ("You gotta love these guys!") and a world-class ballpark experience. In the end, none of that trumps what happens on the field. We Seattle sports fans are a funny lot. We can be among the most enthusiastic in the country, and we start out trusting our teams completely and selflessly. Until they break our trust. And when they break our trust, it's a looooooooong time before that trust comes back. Once upon a time, the Seahawks, Sonics and Huskies all thought they were pretty special, too. Then they all screwed up our trust in one way or another. Ken Behring allowed the Seahawks to bottom out with a two-win season in 1992, then threatened to move the franchise to Los Angeles. Only a Super Bowl appearance restored the team's once lofty position in Seattle sports fandom. The Sonics had this town captivated in the '90s, only to watch it implode behind a series of ill-advised contracts that set the franchise back for years. They have yet to recover, and probably will move to another city before they do. The funny thing is that it's not so much the losing that gets us. After all, Seahawks fans came out year after year for the first 15 years of the franchise, despite the team only posting a winning record five times. The Huskies went through some tough years (by their standards) after being put on probation by the NCAA in the mid-90s, yet UW fans continued to give their team one of the greatest home-field advantages in the Pac-10. 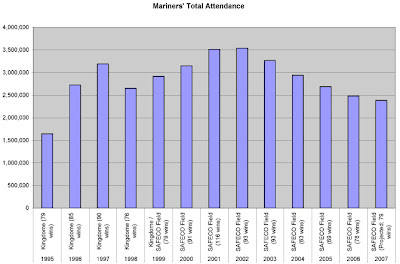 As you can see from the chart below, even the Mariners sustained very good attendance numbers despite their swift decline -- better than any 63-win team had a right to expect. To me, it has a lot more to do with how we perceive our teams that are part of the public trust are being managed for us. And there is absolutely no trust right now when it comes to the M's. I see this everyday on sites such as Lookout Landing and U.S.S. Mariner, where every move is second-guessed. On the flip side, I look at Seahawks Insider, where fans are quick to defend every move made by Tim Ruskell and company. That's the trust the Seahawks have earned, and it's what the Mariners should be looking to get back. The situation is probably more bleak than the Mariners realize. As documented before, it took years before Seahawks fans came all the way back; simply winning doesn't cure all ills. The team made the playoffs two consecutive years in 2003 and 2004, yet still was struggling to sell out all eight home dates. The chart below seems to suggest the same thing for the M's. Despite win totals that have increased each of the past three seasons (shown in red) -- and a team that appears better this year than it has been -- attendance has declined each year (shown in blue). 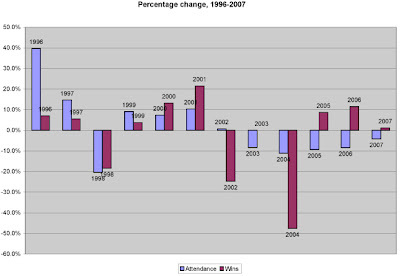 The trend is striking, given that wins and attendance had gone hand in hand every year since 1995. How to explain this? Trust has been broken, and we have no hope that this team is going to get better anytime soon. The Mariners are saddled with multiple albatross-like contracts for players that are severely underperforming (Richie Sexson, Adrian Beltre, Miguel Batista), much of the young talent (Yuniesky Betancourt, Jose Lopez) isn't proving to be anything special, the team's lone superstar (Ichiro) has one foot out the door, and most of the team's prospects are at least one year away -- probably two or three for most of them. Almost two years ago, Mariners President Chuck Armstrong told Seattle Times baseball writer Larry Stone the organization wouldn't consider an Indians-style dismantling of the team. "It's incumbent on us — me, Bill (Bavasi), the baseball guys — to try to get the kind of players that will get this turned around as quickly as we can, as opposed to embarking on the Cleveland approach," Armstrong said. 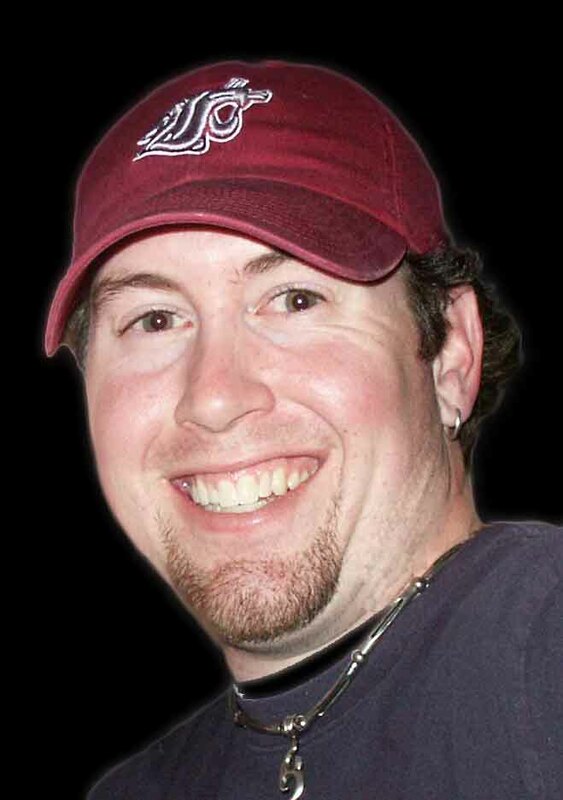 "Cleveland has such a nice little ballclub, yet we're averaging 10,000 more a game. We think we have a compact with the fans — ownership does." Here's the difference, though, between Cleveland and Seattle: The Indians had a team that could have been a viable World Series contender for a number of years, yet the ownership chose to blow it up in a cost-cutting move. The Mariners would have been doing it during the normal cycle of a sports franchise, jettisoning their over the hill players to stockpile the farm system. Had the organization considered such a move three years ago, here's what would have happened, in terms of attendance: The exact same thing! The residual effect of 2001 -- when fan trust was at an all-time high -- would have carried them through the lean years, as fans held out hope that the franchise would turn the corner. Had they not turned the corner, they'd be faced with the same prospects they're faced with now. Instead, what we have is a team that has been patchworked together year after year with bloated free agent contracts in an attempt to continue to lure the "loyal" fanbase to Safeco Field -- a team with no future and no staying power. Worse times are ahead for this franchise, which is in desperate need of new management if for no ther reason than to give a dwindling fan base a reason to hope. The Mariners have been saying for three years that they want to get it turned around before it's too late. I got news for them. They killed the Golden Goose. Thanks for fixing the comments. I just wanted to know if you made the charts yourself. They're pretty. Yes, I did. And thank you. Excel is a beautiful thing. To be honest, the actual charts themselves weren't what got my attention.... it was that you took the time to find the information and once you did, you jumped up out of your chair and exclaimed, finger pointed high in the air, "BAR GRAPHS!!" At least that's way I picture it happening.